The fight announcements were coming at a fast and furious pace on Thursday. The UFC reported a trio of scraps to three of their upcoming events. 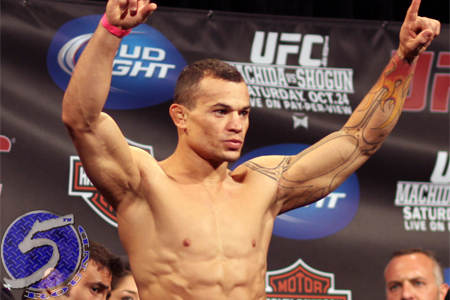 A lightweight shootout between Gleison Tibau (Pictured) and Khabib Nurmagomedov was added to UFC 148. The card takes place July 7th inside MGM Grand Garden Arena, Las Vegas, Nevada. Additionally, featherweight Leonard Garcia meets Matt Grice at “UFC on FX 3.” A venue for the June 8th show has yet-to-be locked down. Lastly, former “The Ultimate Fighter 13” finalist Ramsey Nijem welcomes C.J. Keith to the big leagues on June 22nd at “UFC on FX: Maynard vs. Guida.” While it has not been confirmed, Revel in Atlantic City, New Jersey is expected to host the festivities.